Baaders Morpheus eypieces feature a true 76° field of view immersing you in the Universe without having to roll your eyes. The big eye relief is perfect for observing with glasses and the comfortable viewing- behavior leads to a “Spacewalk-feeling” that normally is provided only by eyepieces with a much larger and inaccessible apparent field of view. Meanwhile the image in no way appears distorted or like viewing through a fishbowl. Center contrast and brilliance match those of the finest planetary eyepieces – while even with the fastest telescope optics you will enjoy tack sharp stars close to the outer edge of the field. Baader have put as much effort into the workmanship as into the optical design. Phantom Coating® Group, rare-earth glasses, sealed watertight housings and blackened lens edges are a given. Practical design is the prime goal: i.e. minimum metal to keep weight at bay, optimized for bino-viewing, photo- video thread – and the all-new 1¼" and 2" “safety-kerfs” to guard against slipping (no undercut). In the night you will love the quick draw eyepiece holster and the photo-luminescent engraving. Photo-Video Adaptation: Like Baader's Hyperion siblings, all Morpheus eyepieces make superb imaging projection optics. 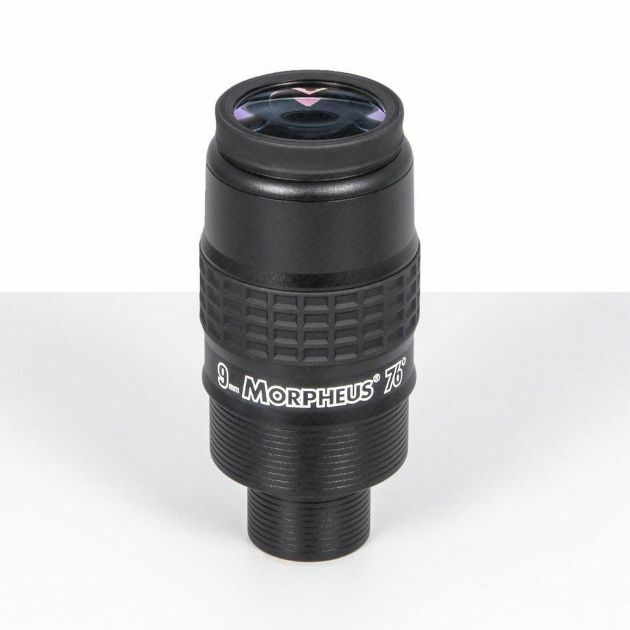 Each Morpheus includes a hidden M43 photo-video eye lens thread that permits use of our extensive range of Hyperion Digital T-Rings. These rings permit direct-thread attachment of practically any imaging device for the ultimate in rigidity and close-coupling for minimal vignetting. 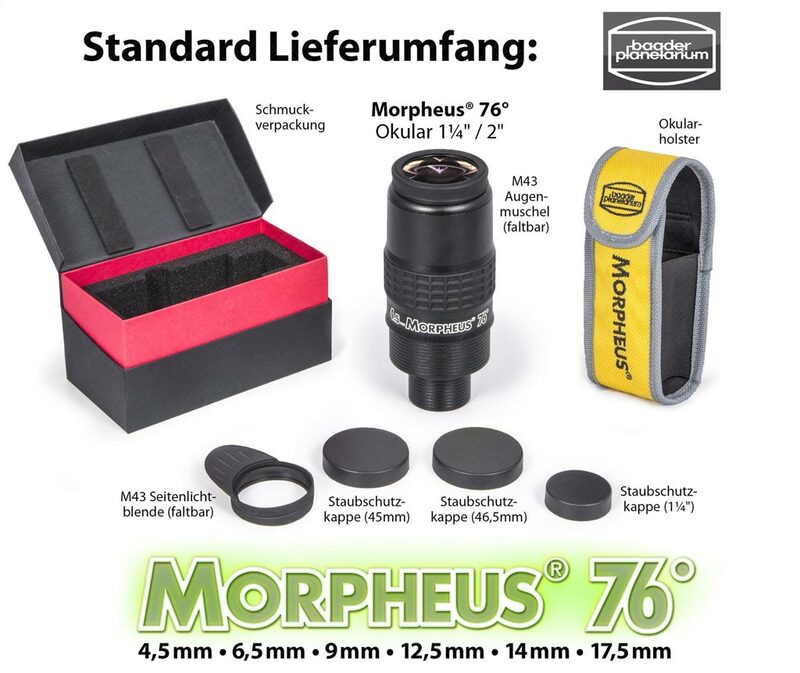 76° Morpheus® eyepiece with standard foldable eyecup, winged/foldable eyecup for binoviewing, storage-box, three dustcaps and cordura eyepiece holster.